Jammu is known as the gateway to the mesmerizing state of Jammu and Kashmir, which is fondly known as the Switzerland of India. Every year a crazy number of tourists visit this northern Indian state to explore its natural beauty and scenic locations. The royal family which ruled this state was the Dogra dynasty (Hindu Rajputs). Various rulers during their rule erected several forts and palaces on several beautiful locations in the form of their residences. Dogra ruler Gulab Sing began ruling the region in 1846 and the second last ruler was Hari Singh who remained on the throne till 1952. Presently, Dr. Karan Singh is the titular Maharaja who is an important figure in politics too. 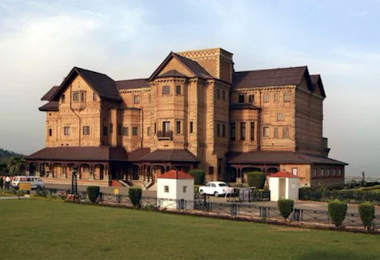 The Hari Niwas Palace has now been turned into Heritage Hotels in Jammu, which has become a wonderful accommodation option for travelers who love to splurge in luxury. Enjoy a pampering experience as the erstwhile royalty used to. The luxurious feel has been kept alive in everything along with the addition of every possible modern-day facility. At Heritage Hotels of India you can book a room as and when the need be, right from the comfort of your home.